Electronic calendars keep Chris and Jane on task, but Cam's mind is it's own very efficient scheduler as he is constantly reminding us of new routines and places we're supposed to be. 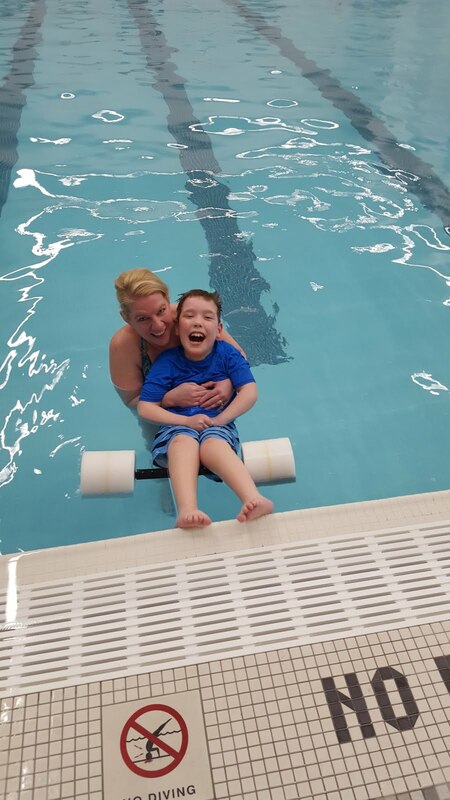 For the past few weeks, it's been swimming lessons on Monday evenings, "working" at Grand Valley on Wednesday nights and a special school activity on Fridays. 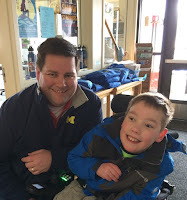 Thankfully, Chris was able to take some time off of work Friday morning to bring the Cam-Mobile to meet his son and Ms. Cris (Meadow Brook helper & picture taker!) for a field trip. 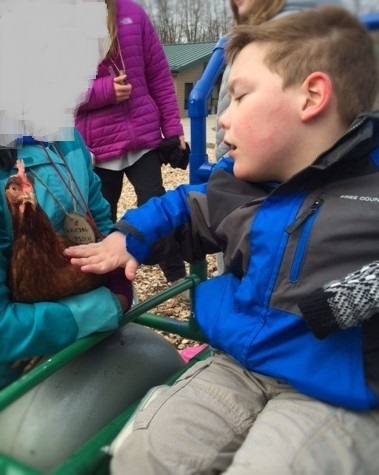 Goodwillie Environmental School in Ada was the destination to participate in a tour and nature hike. Cam learned about the different trees and wooded area, petted a live chicken, and checked out the wood carving location. Perhaps the most notable stop on the tour for Cam, though, was seeing his best buddy, Emma, at her school! Over the weekend, we were thankful for some family pool time at the Y where Cam showed off his kicking skills. On Sunday afternoon, we enjoyed a visit from Michelle and her granddaughter, Ada! The two kids colored together and checked out some play dough. 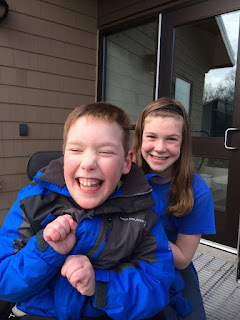 Ada had no hesitation exploring Cam's powerchair and even sat on Cam's lap for a hug. So much fun to meet this cutie who we've only previously seen on phone video! Schedules can be tough sometimes. Keeping up with comings and goings can wear a guy out. On one such occasion this week, Cam had simply had enough. After being upset and apologizing to his parents, on his own accord, he looked up and asked if we had seen his "golden tickets" from school. The golden tickets are given for good behavior and signed by a teacher or helper in the classroom. A reminder to us all that even when we're not at our very best, the very best still exists in each of us and sometimes, we even have a "ticket" to prove it! "What would my teachers say at school?" "Well, they may wonder where the lipstick on your forehead came from." "Well, he might think you have a girlfriend!" "Do I have a girlfriend? How do I know?"